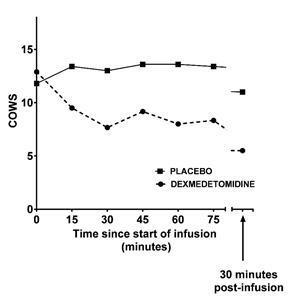 Clinical opioid withdrawal symptoms during an escalating infusion of Dex (10 subjects) vs. placebo (5 subjects). Once symptoms reduced by ≥ 50% the infusion was stopped and symptoms measured 30 minutes later. For subjects who did not achieve a reduction, after 3 hours the infusion was stopped and symptoms measured 30 minutes later. NEW HAVEN, Conn., Feb. 04, 2019 (GLOBE NEWSWIRE) -- BioXcel Therapeutics, Inc. (“BTI” or “Company”) (Nasdaq: BTAI), today announced proof-of-concept data from its Phase 1b study of intravenously-administered dexmedetomidine (IV Dex) in patients suffering from opioid withdrawal symptoms. The positive data from this Phase 1b trial provides evidence to expand the potential market for BXCL501, a first in class proprietary sublingual film of Dex, beyond its current focus for acute treatment of agitation in neuropsychiatric indications. BTI is a clinical-stage biopharmaceutical development company utilizing novel artificial intelligence approaches to identify the next wave of medicines across neuroscience and immuno-oncology.